How do we make sure our characters aren’t boring or falling flat on the page? If you’ve been around the Story Grid universe for a while, you’re probably pretty familiar with what Shawn calls the editor’s six core questions (if not, you can read all about them here). One of the six core questions is—what are the protagonist’s objects of desire? Or, what does the protagonist want and need? Some writers don’t have any trouble answering these questions, but for the majority of us, it’s not always so easy. Can you relate to any of these statements? You know what your character wants, but you don’t know why he or she wants it. You know there’s some kind of universal lesson that you want to explore with your story, but you don’t know how this translates into crafting a lead character. You have a finished a draft, but your protagonist feels flat or boring. Well, don’t worry! In today’s post, I’m going to show you how to flesh out your characters by asking five important questions before you start writing or when you have a finished draft. I’m not talking about those character questionnaires that ask you to list random facts like your character’s favorite color or hobby; I’m talking about the deep and specific questions that will help you get to the heart of who your protagonist really is. In other words, the type of questions that will actually help you write (and edit) your story. 1. What does my protagonist want? In real life, everybody wants something. So, it’s only natural that we as readers will invest ourselves in a character who’s pursuing someone or something–even if we don’t like or agree with what they’re going after. Now, if you already know the external genre of your story, this question might be pretty easy to answer. For example, if you’re writing a murder mystery, the detective’s goal might be to expose the murderer and bring him to justice. If you’re writing a horror novel, the protagonist’s goal might be to survive the threat of the monster and eventually destroy it. If you’re writing a love story, the protagonist might dream of finding authentic love in a committed relationship. Once you know your character’s global story goal, you can come up with smaller goals that she’ll need to accomplish in order to achieve her main story goal. These smaller goals will be her scene, sequence, and act goals. How is my character dissatisfied with her life at the very beginning of the story? What does my character believe will bring him happiness or satisfaction? Why doesn’t she have this yet? Or, if she does have it already, why isn’t she happy? How will my character’s goal change after the Inciting Incident drags him into the main conflict of the story? What micro-goals will help my character achieve her over-arching story goal? Editor’s tip: Your protagonist should have some kind of goal before the reader meets him on page one—even if that goal is something simple like making it to the top of the career ladder, or living a peaceful life. Once the global Inciting Incident occurs and disrupts your protagonist’s life, he will come up with a new or revised story goal. 2. Why does my protagonist want this? Once you’ve determined WHAT your character wants, you need to ask WHY he or she wants it. Why is your protagonist pursuing this particular goal at this particular time in his or her life? What’s motivating them? Motivations are intrinsic needs that arise when something is lacking in life. Characters can be motivated by external things like food or survival, or they can be motivated by psychological needs like self-esteem or acceptance. More than likely, your protagonist is pursuing their external goal because he or she is incomplete in some way on the inside. They are convinced that by achieving this external goal, they will finally be happy or fulfilled, or that everything will be right in the world. So, you can also ask—what’s the underlying emotional reason my character is pursuing this goal? Your protagonist’s motivation is the engine that will drive your entire story forward. And once you understand what’s motivating your character, it becomes much easier to write believable behaviors and actions. If their motivations aren’t strong enough, you’ll end up with a draft where things just happen to your character rather than a story in which the protagonist has agency and makes active choices. Why does my character want what he or she wants? What makes this goal important at this time in my character’s life? Does my character’s motivation give the story a sense of urgency? What does this goal subconsciously represent to my character? What’s the underlying, emotional reason my character is pursuing this goal? 3. What does my protagonist need? Usually what your character thinks she wants isn’t what she really needs in order to feel complete or fulfilled. So, the third question we need to ask is—What does my protagonist actually need? Your character’s subconscious need is usually nothing more than a realization of some kind of truth. Often this truth is something that your character has been running toward or away from for a long time. When your protagonist finally faces this truth, his perspective (either of himself or the world around him) will be transformed, leaving him more capable of dealing with the remaining external problems. What your protagonist needs is directly related to your story’s internal genre. For example, in a Worldview-Maturation story, the character generally needs to accept that the world isn’t as black-and-white as she originally thought. In a Status-Sentimental story, the protagonist generally needs to accept that their definition of success doesn’t match their inner moral compass. What is actually keeping your character from feeling happy or fulfilled? What is she lacking mentally, emotionally, or spiritually? What does my character need to learn or realize in order to disprove their misconception about themselves or the world? 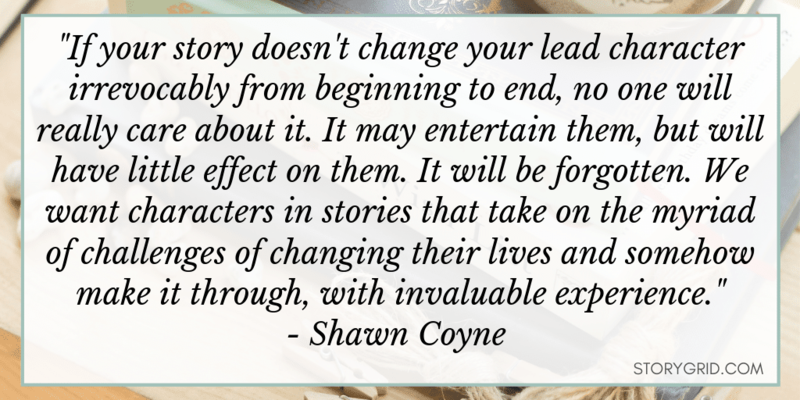 Does your character need to learn this lesson in order to achieve their external story goal? How will your character learn this lesson? What message do I want to leave my reader with at the end of the story? Editor’s tip: Not every story requires both an internal and an external genre. If you’re writing an Action story where the protagonist doesn’t change internally, his need will match his want–to survive the external events of the plot. 4. What’s standing in my character’s way? After the global Inciting Incident of your story, your protagonist will go on a quest to get what she wants. She’ll make a plan and start to execute on that plan, but it won’t be smooth sailing just yet. If your protagonist could automatically get what she wanted, there would be nothing for you to write about—no story. That means you’ll need to throw some kind of conflict in your character’s way to keep things interesting for both your protagonist and your reader. If you’ve been around the Story Grid universe for a while, you’ve probably heard Shawn talk about the three main types of conflict—inner conflict, personal conflict, and extra-personal conflict (if not, you can read all about it here). I find it helpful to zoom out and lump these three types of conflict into two buckets—internal conflict and external conflict. External conflict comes from outside the character. It’s the WHO or WHAT that’s standing in your character’s way in the outside world. For example, this could be an antagonistic character (personal conflict) or force, a hurricane or harsh winter, lack of money, or an asteroid (extra-personal conflict). Internal conflict comes from inside the character. It’s rooted in whatever they bring to the story both emotionally and intellectually. It’s the internal desires and struggles that challenge your character and push her to change emotionally. For example, this could be doubt, confusion, a skewed sense of self, a misconception about the world or their place in it, etc. The secret of writing a successful story is in combining the external conflict with the protagonist’s internal conflict. This combined conflict is what readers come to story for. Readers want to see characters struggle with their external wants vs. their internal needs all from the comfort of their couch. What kind of conflict you’ll rely heaviest on depends on your choice of global genre. A coming-of-age story will hinge on internal conflict, while a fast-paced action or thriller movie will be far more concerned with external conflict. Who or what is standing in my character’s way in the outside world? What misconception does your protagonist have about himself or the world? Where did this misconception come from? What kind of internal conflict can arise from this misconception? How can this misconception manifest in the exterior world? How has this misconception affected your character up until this point? Editor’s tip: When coming up with external conflict, it’s important to consider your antagonist’s object of desire, too. Your antagonist isn’t just getting in your protagonist’s way because he thinks it’s fun. He’ll have his own goals and motivations that are usually competing with or at odds with your protagonist’s. 5. What’s at stake if your protagonist fails? The last question we need to ask is—what’s at stake if my character doesn’t achieve his or her goal? What happens if she fails? In real life, people will move heaven and earth to avoid unpleasant consequences—and so will your characters. If you’ve already decided upon your story’s genre/s, you already know what’s at stake in your global story. For example, in a love story, love is what’s at stake. Will the protagonist get authentic love in a committed relationship? In a mystery, justice is what’s at stake. Will the protagonist bring the criminal to justice? In a horror novel, life is what’s at stake. Will the protagonist survive the monster? As your character pursues her global story goal, she’ll have to make choices and take specific actions in order to move forward. With each one of these choices or actions, there will be something at stake—something to lose or gain. When you understand what’s motivating your character—and what’s at stake—you’ll be much better equipped to write authentic actions and choices in each crisis moment. What does my character stand to gain if she’s successful? What does she stand to lose? What does my character stand to lose if she fails? What does she stand to gain? How will success or failure affect him externally and internally? What will success or failure mean to my character? What will my character have to give up or lose in order to achieve her story goal? Creating compelling characters for a story isn’t always an easy task—but it is necessary if you want to write a story that works. 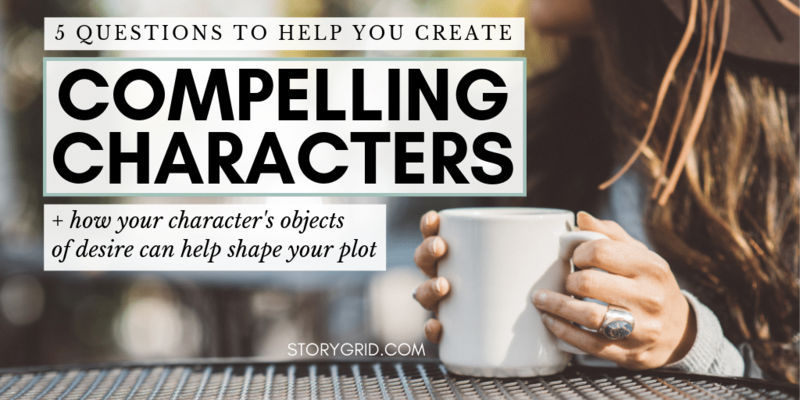 Hopefully, you can see how asking these five key questions can not only help you create well-rounded characters that readers will love, but can also help you start to see the shape of your story’s plot. And if you ever get stuck in the middle of your draft, you can come back to these five questions—as well as the editor’s six core questions—to help you get unstuck and back to writing! To learn more about crafting characters or writing fiction, check out the articles on Savannah’s website or sign up for her e-mail list to receive writing and editing tips straight to your inbox. If you want to work with Savannah on your story, you can book a FREE 30-minute strategy call with her to talk about what you’re working on and how she can help! Let’s discuss in the comments: What methods do you use to get to know your characters? 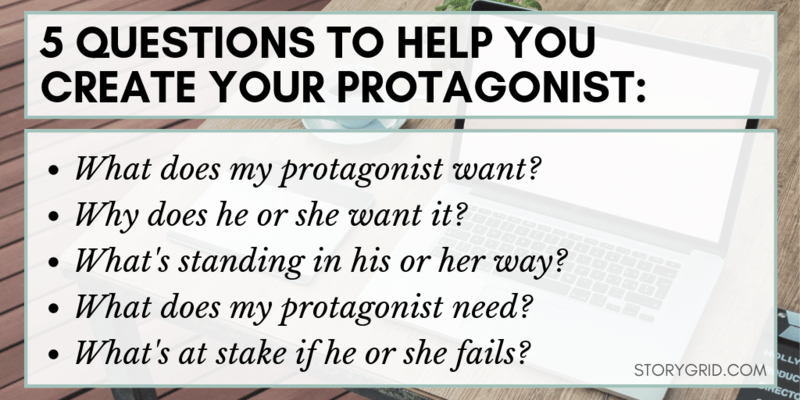 Did these five questions help you flesh out your story’s protagonist? Savannah Gilbo is a writer, developmental editor, and book coach based in Southern California. Her mission is to help writers sharpen their skills, strengthen their craft and write better stories. Being a writer herself, Savannah understands the struggles and fears writers face when trying to turn their book dreams into realities. Through coaching and developmental editing, she works with writers of all skill levels to combat these fears, and take their stories from an idea or messy first draft to a finished manuscript that works. Savannah believes that anyone can write a book with the right guidance, tools, and support. When she’s not busy creating her own stories, you can find Savannah mentoring other writers on her blog, or curled up with a good book and her furry partner in crime, Coco. Hi Savannah, I found this very helpful in making me reassess everything I know about my character and her wants and needs. I wasn’t able to answer all the questions at first but after several readings I arrived at the answers and made some corresponding shifts in the story line. I’m probably still a little shaky on some of the questions but at least I know what the questions are that I need to be asking. Super.